Circles are powerful magickal constructs that can help power you’re working, and help you in your rituals, and spellcraft. These constructs can be constructed, and used in order to direct specific energies two specific places. By understanding the ins-and-outs of the magickal circles one can construct unique powerful designs that will incorporate metaphysical understandings, occult understandings, correspondences, associations, shapes, alphabets, glyphs, sigils, and words to create beautiful designs that will act as tools to help you direct energy in very specific ways. By incorporating all these things together a practitioner can allow these things to work in harmony, so that they can help manifest their will. The practitioner will need to learn how the different parts are connected to each other, and what they stand for in order to create powerful magickal circles. In this post we will be familiarizing ourselves with the different parts of the circle, and how they interact with the energies, so we can put them together in some form of a system that will help us in specific forms of magickal working. The first thing we are going to talk about is the basic part of the circle which is the circle itself. Magickal circles are generally made with a main circle that goes around the center, that acts as the space in which the practitioner can move around, and interact with their working. The main circle is going to act as a doorway between the two worlds of the spiritual, and physical, and will be the place magick is performed from. This circle will represent the unity of the two worlds, and will also be the area where energy will gather, so that you can use it for your spell, or ritual. The circle is connected to the spiritual realms, and the higher planes of existences, and we’ll call energies down from the universe in order to help you, and your practice allowing you to raise a cone of power. Energy is going to pool and gather inside this main circle empowering you and the rest of the circle. The circle will also bring in feminine, and yin energies into your working, and will protect you from outside forces you do not wish to interact with while you are doing your practice. You can have more than one main in your design these will act as different levels in the overarching paradigm of your design. Other circles can be incorporated into your design, these will be treated like smaller versions of the main circle, and will be places for energy to pool, and to form their own cones of power. Inside the circles will be good places to put sigils, glyphs, names, and/or symbols, so that energy taken into the circles will be able to empower the symbol within. This will result in the energy inside the circle taking on the intent of the sigils, glyphs, names, and/or symbols allowing you to use that to affect your practice. If you have other practitioners helping you out in your practice, this could also be a spot for them to reside in to help you with your working instead of using some form of a sigil, glyph, name, and/or symbol. These circles will also provide protection for whatever resides within that circle just like the main ones do, and will also bring feminine, and yin energy into your circle. The center is the middle point of your circle. This is a very important point, because it controls, and affects everything else in the circle. This is where the main intention, or the controller of the magical circle is placed. You are usually the controller of the circle, or you can put a sigil, glyph, name, and/or symbol in this place. Whatever is in the middle of the circle will act like the generator in a crystal grid, and will act as a conduit to the rest of the energy in the circle, so that it’s will can be acted out. The center will act in this way in middle of every single shape, so it is important to be aware of this. By understanding how to get the most out of the controlling center points of the shapes that exist within your design will greatly help you understand the energy flow through out your circle, and how it will empower your desire. Squares can also be incorporated into your design to help empower your practice. They will bring forth the energies of the elements, and directions along with the masculine, and yang energy that the square embodies. The square is also connected to the physical world, and when the square is brought together with the circle the square supports, and fortifies it empowering the circle, and creates perfect balance with its female, and yin energy. This will create a good balance in your circle, and will allow your circle to represent duality. You could also put a sigil, glyph, name, and/or symbol inside the square. that would give whatever is inside stable, balanced, and grounded energies that it can use to fortify and support itself, so it can do its job more effectively, and use the energy of the four elements, and four cardinal directions to help it in it’s working. The cross just like the square is also connected to the four elements, but is instead connected to the five directions (the five directions include center as the 5th direction). The cross is also connected to choice, hope, balance, masculinity, physicality, sun, life and yang energy. The cross in magickal circles will direct energy to the center, and will compartmentalize other energies into the four slots that it creates. The cross can be a tricky thing to incorporate into some circles, but when used right it can be very effective. The energies of the triangle can be brought into your design of your magical circle. These triangles will stand for, and will be greatly connected to creation, and manifestation. Triangles are used primarily in circles to create, manifest, or call a specific energy into the circle, so that you can work with it. The triangle is also connected to the balance between the trinities, and will bring balance of those energies in to your magickal circle. Triangles have both masculine, and feminine energies , and yin, and yang energies depending upon which way they are facing. An upright triangle is a triangle that manifests things to you, while the inverted triangle is one that manifests your desires upon the external world. The upright triangle is the one who embodies the feminine, and yin energies, while the inverted triangle is the one who embodies the masculine, and yang energies. Upright, and inverted will be decided upon the triangles relativity to the center of the circle. These are also used as the places to summon entities through invocation, and evocation. The traditional version of a evocation triangle is call the triangle of art. Triangle of arts are upright because it is used to manifest entities to you. When the triangle is used for evocation it is put outside the circle in order to give the practitioner some protection, and space in between them, and the entity. These triangles usually have names of powerful spirits or deities around them to act as a form of binding, so that the practitioner can control, and worked with the entity safely. These triangles also usually have circles inside them to allow the entity to have its own space that will be in between the physical, and the spiritual worlds, and will also allow them to build up more energy to help you in you’re working. Depending upon where your triangles are placed will communicate, if yours magick circle is a evocative circle, or invocative Circle. Triangles can be very useful when trying to manifest constructs, and will be very important tools to incorporate into your magical circles. Lines, and curves are used to combine two points, so that their energies can directly interact with each other. Lines represent the masculinity and yang energy, while curved lines represent feminine, and yin energy. Lines, and curved lines also stand for the energy of balance, and duality. When two constructs are connected with a line, or curve the two points, become the two extremes on a polarity spectrum with a line in the middle representing the space in between those two energies. These lines, and curved lines will also be used to move energy through out your circle. This is done, because energy will take these lines as paths to follow, and a physical mark of your intention, so the energy will enjoy moving on these lines like the water in a river. These lines, and curved lines will take on the energy around them, or that interacts with them, so by writing symbols, names, and/or glyphs under, above, and/or near will Infuse those lines with that type of energy, given that line its properties, associations, and magical correspondences allowing it to flow throughout the circle. It is important to remember that these lines, and curved lines make up all shapes that will be used in the magickal circle. This will truly apply to any place within the circle and must be kept in mind, so you can use it effectively to empower your working. The pentagram, and pentacle along with the inverted version of both of these can be brought into the design of your circle to bring in energies of power, protection, connection to the five western elements, and connection to the wu-xing (the five phases). These will greatly empower your circles by allowing the energies they produced to run throughout it in order to charge, and power your working. Depending upon what you are doing with your circle will determine whether you will want to include upright pentagrams, or inverted pentagrams, or you might even try to include both of them. Whether it is a inverted, and upright pentagram, or pentacle will depend on its relativity to the center of the circle. Using the upright pentagram would bring the energies of the external, feminine, yin, and spiritual world to help you in you’re working, while using the inverted pentagram would bring the energies of the internal, masculine, yang, and physical world to help you in you’re working. The Inverted pentagram is a lot more connected to the self, where the upright pentagram were connected to the collective, both are very wonderful symbols and can help you out on in creating your own magick circle. Simply by adding a circle around the pentagram, it will become the pentacle. inverted, or upright the circle of the pentacle will add energies of unity, and protection to the already existing power of the pentagram, but it is up to you to decide when to use which. Another wonderful shape that you can bring into your magickal circle creation would be the hexagram. The hexagram is made when an upright triangle, and an inverted triangle meet to form the shape, because of this the hexagon shares correspondences with both triangles, and is also made out of masculine, and feminine energies, and yin, and yang energies. The hexagram also corresponds to the four elements and the Trinity because of the triangles that is made out of. The hexagram is also connected to the planetary energies, and is also connected to the western four elements. 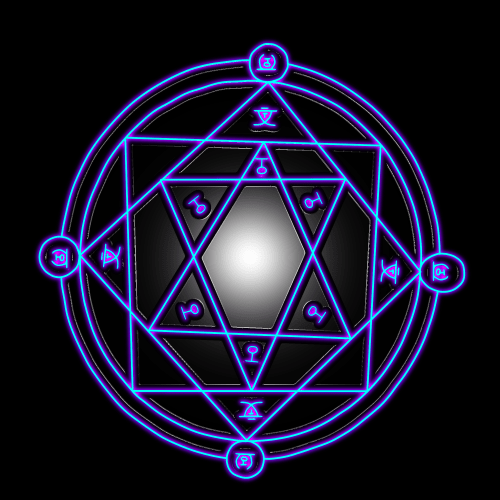 Due to the fact the hexagram is made of the connection of the two triangles it is connected to both external, and internal manifestation, which makes it a good tool to have in magick circles that are related to invocation, and evocation. Sigils, glyphs, names, and symbols are going to be powerful tools that will help you in the creation of your own magickal circle. All of these constructs have energies that are going to be used in order to empower, and guide you’re working towards your desire. 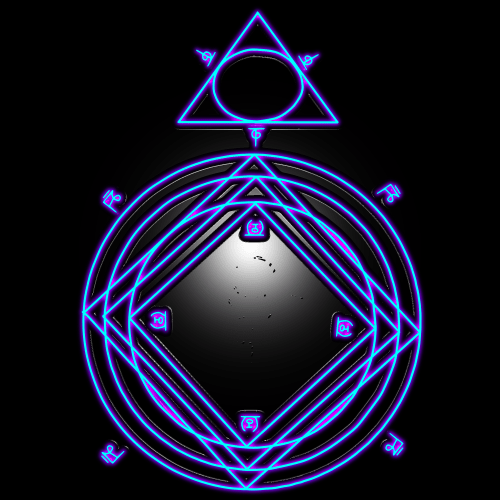 Every one of these sigils, glyphs, names, and symbols is going to have its own correspondences, energies, and associations that will add different effects based on which one you choose, and how you choose to implemented into your circle. These can be taken from anywhere, or even created. This will not only personalize your circle, but will also provide energies that will be helpful with specific rituals, and practices. you can also choose to incorporate names of specific entities in order to invoke them to your ritual to help you accomplish your desires through the use of the circle. All you would need to do is to write an entity’s name in, around, or near a specific aspect, or shape to connect their energies to that construct, so that their energies can help out your circle to manifest your desires. Their energy will usually show up to help you out, if they are willing to help you in your endeavors. Any surface that is blank in your magickal circle can be filled with some form of sigils, glyphs, names, and symbols to empower that specific part of the circle to represent a specific energy. By learning how these energies interact with each other, and work together to form one common goal the practitioner can craft a very effective circle in order to help them out with specific intents. Any shape that surrounds, or is near these sigils, glyphs, names, and symbols will be influenced by their energy. Learning all of these elements of the circle will allow you to bring all these aspects together in perfect harmony to create a magical circle, that will be good for the workings that you want to do. It is a very creative, and magickal process that will push the extent of your metaphysical, and occult knowledge. But, through the creation of a magickal circle you will greatly be able to empower you working, and to better your magical effectiveness.